Tulsa wedding venues see many large and small DIY projects. DIY projects are becoming increasingly popular for various types of decor including weddings, dinner parties, dances, birthday parties and more. Not only do DIY projects help keep your budget intact, but they also allow you to create unique decor that you can’t find anywhere else. It’s great to create something that is unique to you and your wedding! There are many types of DIY projects that are popping up all around at Tulsa wedding venues. Some are super large like big, beautiful backdrops and some are somewhat smaller. Calligraphy for your wedding stationary and décor is a smaller, unique and personal statement. Faux calligraphy is the perfect DIY solution for people who aren’t familiar with the art calligraphy but want to achieve the look. Faux calligraphy produces the same beautiful results as regular calligraphy but with a fraction of the effort. Check out this faux calligraphy tutorial that ProFlowers put together. It includes the tutorial steps, tips and inspiration for how to use faux calligraphy at your next event or wedding! 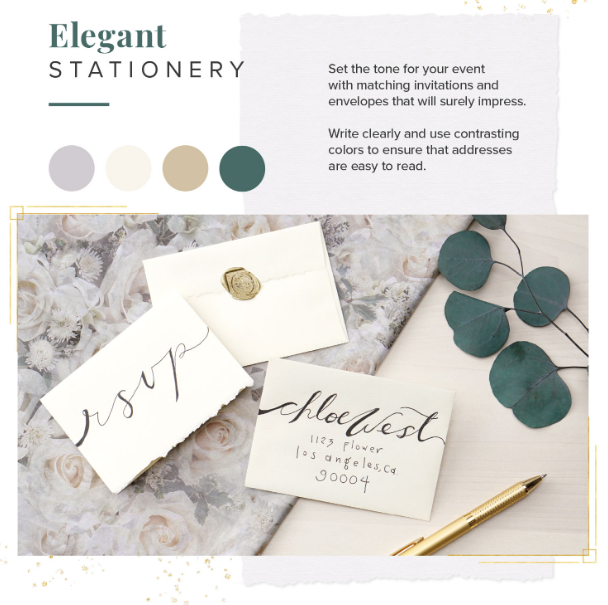 The visual includes six simple tutorial steps and gorgeous examples of how to use faux calligraphy in DIY projects, like wedding stationery and decor. Personalize your Tulsa wedding venues with your own calligraphy stationary and décor. It is the perfect way to make a statement and make it your own!